Not long after the opening ceremony, the incident with Wakaba-chan and Kaburagi was the talk of the school, and already it had caused waves to spread. Plenty of students had come to them to find out the truth, but both of them gave the same answer. Whoa, whoa, you think any girl who Kaburagi just ‘met at the gates’ would be able to walk in while having a friendly chat with him? When they pressed her further though, she said that mostly they were just talking about that last exam before the break, or about maths, or physics, and pretty much all about their little competition for better grades. Thanks to that, everybody tentatively accepted it, for now. It wasn’t a secret that Kaburagi had called out to her at the rankings boards for the term-end exams. But you knooow… Although everybody else might have believed that Kaburagi was only interested in her as an academic rival, as somebody who had read Kimidol this whole situation just reeked of suspicion to me. As if that wasn’t enough, at the Summer Party I found out that he had gotten over Yurie-sama. I’m pretty sure it was true. I think that waltz with her was his farewell to his first love. Even I couldn’t help but feel sad for him. I’d never experienced anything like a love of over 10 years, but it must have been hard. It wasn’t unreasonable that it took him over 8 months to get over it. He had liked her for 14 years after all. Not that I didn’t pity Yurie-sama for being wracked with guilt all that time, though. A first crush of 14 years was pretty long though. Kaburagi must have been 2 or 3 at the time. Who knew that a 2 year old infant could even have a crush. I voiced my thoughts to Enjou and he told me that Kaburagi had just said that because that was when he first met Yurie-sama. The crush actually really began when he entered kindergarten. At least that’s what Enjou thought. I heard that the kindergartener Kaburagi had followed her around crying “Yurie~ Yurie~” and Yurie-sama said that he was so cute that she couldn’t help but always play with him. Yurie-sama had been in primary, and considered him a bold but adorable little brother who adored her. Kaburagi had been a preschooler who was glued to her, and thought of her as the girl he liked. Ah, but when I met them at the summer party, both of them seemed happy and well, so all’s well that ends well, I supposed. No sooner had we entered 2nd Year did they hold the election for Student Council President and Vice President. This year the strongest candidate for President was, obviously, student council member Fellow Stalking Horse. Not only were his grades good, but he had served as the StuCo President in middle school as well. Plus, he was popular with the girls. In the end nobody could rival him and he won the place without any trouble. And then, instead of being voted in, the President chose their Vice President from within the Student Council, and of all people Fellow Stalking Horse nominated Wakaba-chan! Eh!? Wakaba-chan was part of the Student Council!? I mean she had great marks, so I guess it was pretty natural but… Huh. This had never happened in the manga. Manga!Wakaba-chan was already hated by everyone by the time she entered 2nd Year, so it wasn’t possible to begin with. But although some people still hated her in this world, she had almost no connection with the Emperor. I guess that’s why she managed to join. If you looked at it a certain way, Wakaba-chan was so talented it was almost crazy, so she would definitely help them a lot. Do your best, Wakaba-chan! Ah… But then the Pivoine never switched presidents until the end of the year. Youko-sama wasn’t stepping down any time soon. Was Wakaba-chan going to be okay…? The 3rd years were stepping down everywhere else but it had nooothing at all to do with me, so I was as carefree as could be when the Club President dropped a bombshell. The President was checking my interest. Who could have foreseen this happening. But gosh~ Me? It’s me, you know? The girl who was stuck as a provisional member until last year, you know? Still the least skilled member of the club, you know? When there were so many skilled and orthodox members of the club around, I didn’t think they would agree to making a maverick like me the President. Well, she wasn’t wrong. During the summer break I tried to come here as often as possible. Even if I couldn’t embroider, and was almost no use in helping with the dress, I did make some decorative roses and I helped with the clean-up. “Reika-sama, we’ll all be here to support you as well, so could you please become our President?” asked Azai-san from my grade. Before I knew it, everybody else was gathered around and asking me to be President as well. Everyone nodded with a smile. Last year I was resigned to being a (provisional) member. This year I had finally become an official one. And now, to be the President of the Club…!? If this wasn’t a vigorous climb in ranks then I didn’t know what was! 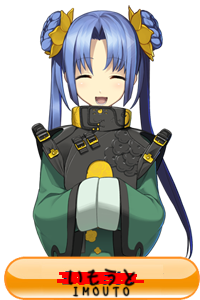 “I shall do my best!” I declared, and everybody cheered and clapped. From today onwards, I was Kisshouin Reika, President of the Handicrafts Club! Ah. But the newest Club President hadn’t made any progress at all on her school festival submission. What to do? When I tried making the face, one of the eyes half came off and turned into something from a horror movie. Dog Lover-kun could never know. It seemed that during the summer remedials, Class Rep and Iwamuro-kun had really grown friendly with Honda-san and Nonose-san. Recently I occasionally caught sight of them together. Besides them, I often saw Fellow Stalking Horse and Wakaba-chan together, since they were both Student Council members. Sometimes I even saw Kaburagi casually saying hi to her. I was in the salon when Youko-sama muttered something between sips of her tea. I immediately escaped the salon to head to the Handicrafts Club. G-, Gosh, I’m so busy now that I’m the Club President. Well, it’s in the name now. Gotta live up to it, you know? Btw, why are they advancing grades after summer vacation? I thought they did that in April. Yeah, all they want is the increase in budget. Not all samurai were warriors either. Some of them actually did the boring work of governing. If anything, it’s about the only thing she’s good for because of her high status. Thanks for the chapter. Am I first!!??! Whoa there’s trouble brewing… Can’t wait. The Club President Reika-sama is doing her best to avoid being involved XD! Pfft. I bet the Handicrafts club saw Wakaba becoming StuCo VP, predicted rough times ahead (probably from the Pivoine side), and made Reika the Club-Pres as a safety measure. I doubt that they’re that prescient. I expect it’s a confluence of a lot of other little things, not Wakaba specifically, that makes them want to promote Reika. 1) Her not being the leader of the group might be taken as an insult. 2) There are other fringe benefits like increased protection of its members, looser regulations and an increased budget. 3) Reika doesn’t actually have the skill to contribute to club projects like the wedding dress. So the only way she’s useful is if she does all the *cough* administrative work. Well maybe not all those things exactly. But these are good possible reasons. The benefits might not be guaranteed, but hey, why not curry favor if you can? hohoho..this getting more n more interesting…will reika-sama meet his cousin look alike again? the birth of new route?…will handicraft club be okay?? Oh, the club will be okay because now the club member (more or less) adore Reika. I am more interested with this new route. *offtopic*For some reasons whenever I see ‘great’ and ‘again’ in one sentence I can’t help but shiver in fear or wait…is it disgust? At least Reika have some reasonable reason to reject annoying things that will coming this year. freaking hilarious especially the last part I can almost see Reika-sama doing ohoho, I’m so busy since I just became the club pres.😂 I can definitely see th desperation of looking for an exit door, thank you so much for the triple release. And wow!! Iwamuro-kun likes girls huh, still…it’s a nice thing he has yet to cross the road. Or who knows. Gender can not dictate ones happiness. Really? I kind of saw that in Iwamuro-kun. Like, eh loves everything, and I mean EVERYTHING about girls kind of thing. Or just obsessed with cuteness. Are we still ignoring how Reika sees Bea-tan as a “real” friend? Poor Reika she’s falling into the abyss of her own mind. She’s open-minded and good at playing along. Just look at her and Iwamuro-kun’s first interactions. I wonder if this chapter marks the sign of the Fellow Stalking Horse x Wakaba-chan route. Lol! Now is your chance Reika-sama! Now, you can make a reality the speech that you gave when they made you a full member, they stopped you then. What are you doing Bakaburagi, Stalking Horse is scoring points with Wakaba-chan. You have to get together with Wakaba-chan so that Reika-sama wouldn’t end with you. Well, Reika certainly has the gusto and charisma needed for presidency, but will she really be all right? If Trump can do it, she certainly can. Make the Pjvone great again? Man, Trump can’t do nothing. A rock would do a better job. Rocks could have done a better job voting than the people who voted for him. Thank God I’m a Californian. Less delusional Trump supporters around me. Reika got herself an escape route just in time. Run Reika! Run! Run to your club! The secret is that the romance tag is there because of all the supporting characters. every little interaction between our female lead and a male character gave me hope, only to see it disappear into thin mists of the night. And will my wish (and reika sama’s wish for a boyfriend while she’s still a high school student) be realized? ?!?!?!!!?!!!! Scotch on the rocks, Reika. There there. Drink the pain away. If Reika becomes a club president, does that mean there will be more Reika and Wakaba interaction in the future? I like her role as a bridge between Pivoine and StuCo. In like, 5 chapters. You’ll have them by the end of the week, promise. Haha omg I can totally see Reika dashing toward any possible exit xD. I’m looking forward to the moment Reika befriends Wakaba tho ^^ )) Thanks for the chapter! It’s kind of nice that Kaburagi is in a healthy relationship. LIES. Reika they just want to use your position! Do not listen to their honeyed words! This is actually really great development for Reika! Scary president-less time to eat pastries in Pivoine=not getting fat! The kaichou of the handicrafts and soon to be kaichou​ of the pivoine 😂😂😂 ganbare reika! yay, your love and hard work really come through! its so good everybody in the club can see your true self!